Municipal Government: Orr, Minnesota (City Administrator, 12 years); 199? to 20?? He moved to Crane Lake, Minnesota in 1982. He died of cancer while still in office. Session Notes: He died while in office on August 8, 2015. "State Rep. David Dill Remember by Local Officials." Lake County News Chronicle, August 17, 2015. Mullen, Mike. "Colleagues Remember David Dill as House's 'Quiet Giant'." Politics in Minnesota, August 12, 2015. Walsh, Paul. "Rep. was a Champion of Outdoors." Star Tribune, August 10, 2015, p. A7. 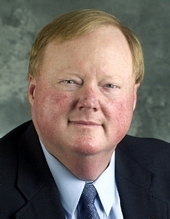 "State Rep. David Dill of Crane Lake Dies of Cancer at Age 60." Duluth News Tribune, August 9, 2015. Brown, Aaron. 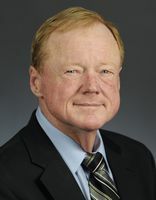 "Iron Range-area lawmaker dies of cancer." Minnesota Brown, August 9, 2015. Coombe, Tom. "State Rep. David Dill Loses Cancer Fight." The Ely Echo, August 9, 2015. Hanna, Bill. "State Rep. David Dill, DFL-Crane Lake, Dies from Cancer at Age 60." Mesabi Daily News, August 9, 2015. Lebens, Nancy. "State Rep. David Dill Dies." Capitol View Blog, MPR News, August 9, 2015. Lawler, Christa. 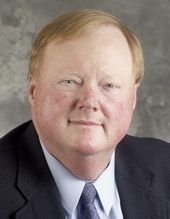 "State Rep. David Dill, 60, Dies After Battle with Cancer. Pioneer Press, August 8, 2015. Cook, Mike. "Now is the Time: After Years of 'Unofficially' Representing the Interests of His District, Dill Takes a Seat in St. Paul." Session Weekly, St. Paul: Minnesota House of Representatives Information Office, January 17, 2003, p. 12.